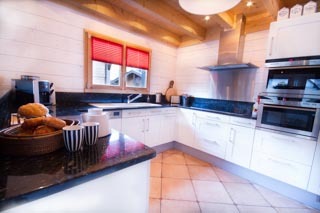 Chalet Grand Paradis is a newly built self-catered ski chalet perfectly located on the edge of Morzine. This means you’re close to the centre, but return home to a quiet residential area, away from any late night noise. It has 5 bedrooms and can comfortably sleep 10-12 people. The free ski bus stops right outside to transport you to and from the ski slopes and the centre of Morzine is just a 15 minute walk. 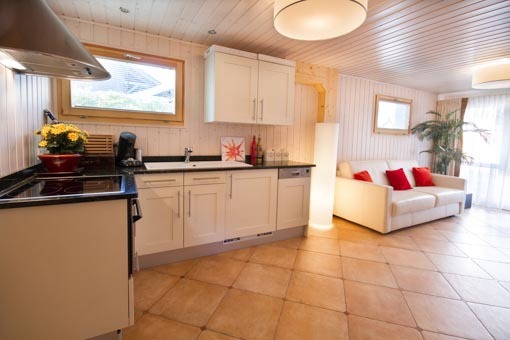 The chalet was built as a family home and designed with space, comfort & quality in mind. It is finished to a high standard with luxury contemporary furnishings. 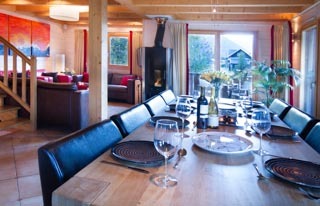 The spacious chalet is spread out over 3 floors. The layout is perfect for mixed groups looking for some independence as the ground floor can be a separate apartment. The ground floor is a spacious apartment with a lounge, kitchen, double bedroom and shower room. A comfortable sofabed in the lounge of the apartment can sleep an additional two people if required, effectively creating a 6th bedroom. The first floor is open plan giving a lovely feeling of space. It has a large kitchen fully equipped with modern appliances and a real wood dining table with comfy leather chairs. There is even a Krupps bean to coffee machine, a fantastic feature for real coffee lovers. The snug seating area has big sofas and a log burner for a cosy feel on a cold winter night. Double doors open out onto the balcony with stunning views up the valley towards Pointe de Nyon, the perfect place to enjoy a glass of fizz after a day on the ski slopes! 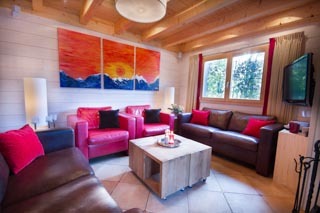 The living area is equipped with a TV (Dutch, English & French channels) and DVD player. There is a large selection of music preloaded onto the Bose sound system and the chalet has WiFi internet access. Each stylish bedroom has it’s own shower room, and they are well equipped with storage for your gear. 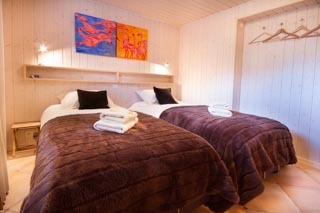 All rooms have a snug wooden chalet feel, so you know you’re in the mountains! One bedroom is located in the ground floor apartment and the remaining 4 bedrooms are on the second floor. 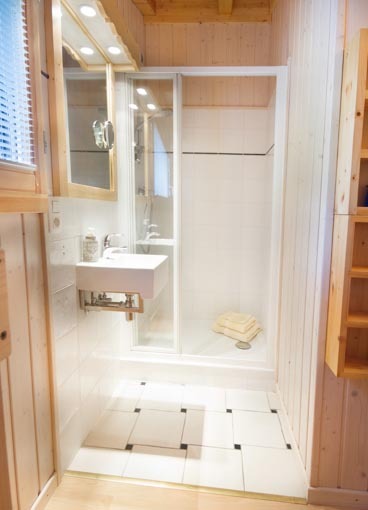 There are two bedrooms at the front of the chalet which open out onto a shared balcony and both have ensuite shower rooms & toilets. 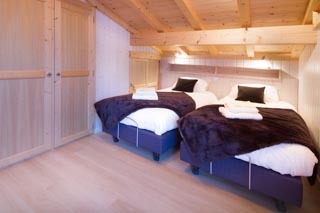 There is also a double room and a bunk bed room at the rear of the chalet, both with ensuite showers and a shared toilet on the landing. 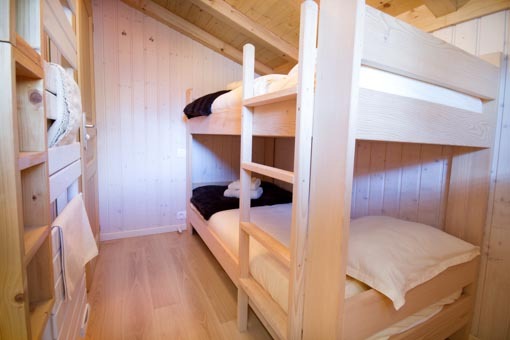 All bedrooms (except the bunkbeds) can be configured as twins or kingsize doubles. Jo will meet and greet you when you arrive and is always on hand to help with any questions you have. 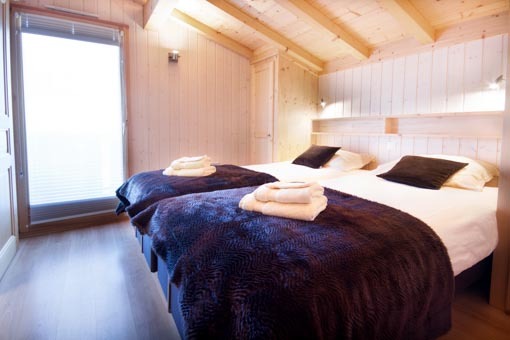 The chalet will be spotlessly clean for your arrival, and all beds made up with good quality bed linen, fluffy duvets and pillows and fresh towels. 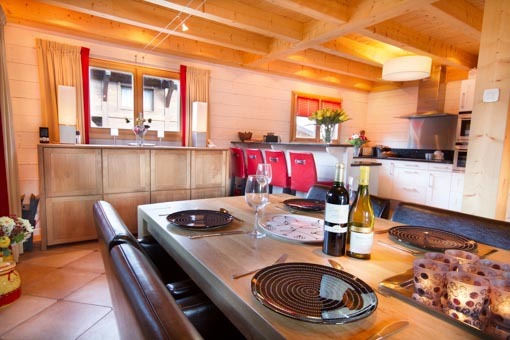 There is parking for 4 cars directly outside this Morzine chalet, with one covered space and a ski locker is located at the rear of the building. Ground floor bedroom with adjacent shower room. Twin beds and an ensuite shower room. There is a shared toilet on the landing. Shared Balcony with twin beds and ensuite shower room. Bunkbed room with ensuite shower room. There is a shared toilet on the landing. 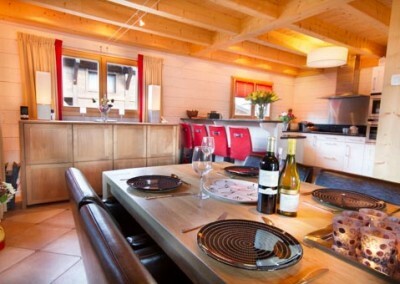 The chalet is located on Route de la Plagne in Morzine, about a 10 minute walk from the centre. The free ski bus stops opposite the chalet to transport you to the centre of Morzine. Alternatively for those wanting to ski from Ardent, it is an easy 8 minute drive up to the car park. Perfect location. Great chalet. Fantastic views. 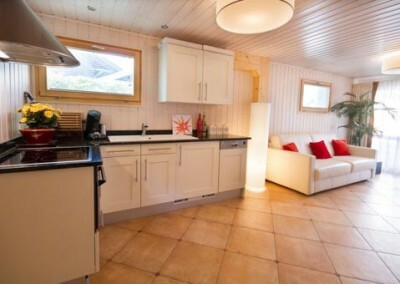 Ideally located in between Montriond and it’s beautiful lake and Morzine. Walking / cycling distance to everything. 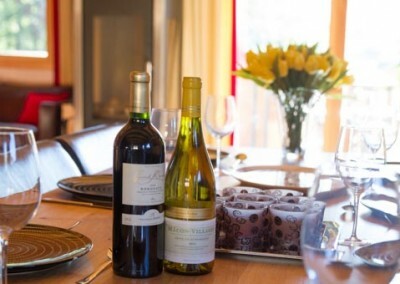 Chalet was very well equipped, presented to a high standard and extremely comfortable. We were very well looked after by Jo and look forward to our next visit to Morzine! Justine S.